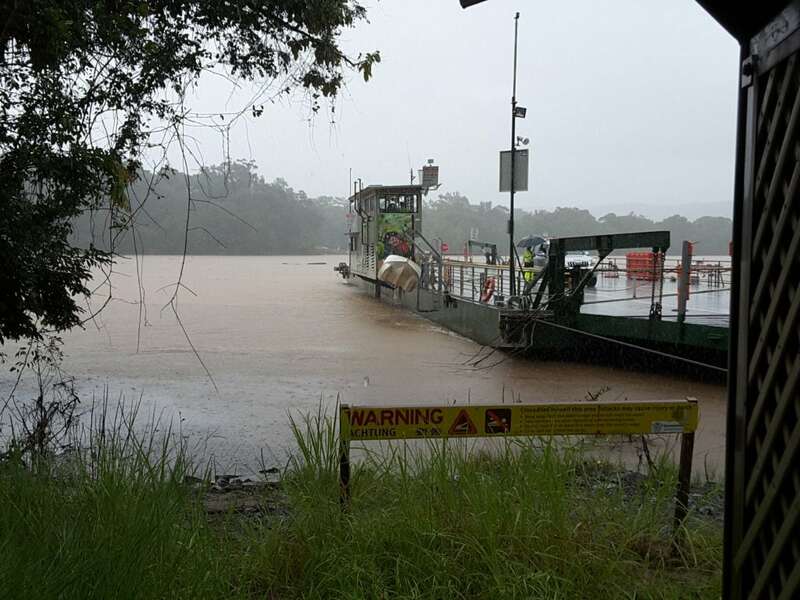 12PM – Daintree Ferry update: The ferry operator has restarted operations. Severe vibration due to the extreme river current has damaged the drive wheel and guide pulley components. The ferry crew has worked in the rain since daylight this morning to repair and replace these parts. A test run will be completed in the next half hour to ensure all is OK and clear debris from cables. If this goes well, the ferry should be operating business as usual. The ferry operators would like to thank the community for their understanding and co- operation; and are crossing their fingers that the remaining ‘wet season’ is less eventful. 8.00PM – Due to the extreme weather, it is predicted that the ferry will not operate until after high tides tomorrow. The river has risen very quickly. Water over the northern precinct was 400mm deep at 7:20pm and the southern precinct was 300mm under water. An update will be provided at lunch time tomorrow, or before if conditions change. 3.00PM Daintree Ferry update: Preparations have begun to recommence the ferry service at approximately 4.30 – 5.00PM. It is recommended for essential travel only as ferry service may stop tonight at high tide depending on rainfall & river conditions. At present water is covering north bound access road. 12.30PM Daintree Ferry update: Conditions in the Daintree River remain unchanged & not favourable to operate. The Daintree Ferry operator has closed the ferry crossing until further notice due to flooding in the Daintree River. Daintree River levels remain high with water continuing to flow above the loading ramps. The ferry contractors have advised it is unlikely that operations will start back up until 12.30pm today due to continued forecast rainfall and the king tide coming in. Once conditions ease, operating cables will need to be checked and cleared of debris; and machinery removed from ferry. Ergon Energy also have a helicopter ready to locate a fault that has caused a power outage for 97 customers in Daintree Village.